There's an old saying, "fake like a two-cent coin" or "a three-cent coin." While these obscure denominations haven't seen circulation for a very long time, there ironically were two-cent and three-cent denominations of U.S. coins (the latter known as a "trime") during the 19th century. What's more, there were even gold coins with odd denominations: the short-lived $3 gold coin, the $2.50 quarter eagle and $5 half eagle, and gold $4 "Stella." At one point in the middle of the 19th century, the mint was even issuing a $1 gold dollar coin alongside the silver dollar. 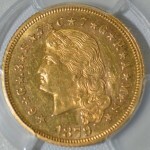 The Gold Stella is one of the least-known American gold coins, but is revered by American numismatists among both numismatic historians and hobbyists. The Stella coin may seem like an odd-ball, but it was intended to compete with other similar-sized gold coins in international trade. When it came to global trade, the U.S. Mint had a bit of a Goldilocks problem: quarter eagles ($2.50) were too small and half-eagles ($5) were too big compared to the preferred gold "trade" coins like the British Sovereign, French Napoleon, Italian 20 lire, and Spanish 20 pesetas. Hence, the $4 Gold Stella went into trial production. Interestingly, the Gold Stella never made it past this trial phase, which makes the extant Stellas pattern pieces (also known as pattern coins or simply "patterns") that were minted in extremely low quantities. In addition to its rarity, collectors also enjoy its eye-appealing proof design and novelty. The pattern design was only produced during 1879 and 1880. The coin shows Lady Liberty facing left on the obverse and a five-pointed star (where the name stella comes from) on the reverse. Inscriptions on the reverse include "E PLURIBUS UNUM" and "DEO GLORIA," Latin for "Out of Many, One" and "Glory to God," respectively. It came in two different varieties: a Flowing Hair design and Coiled Hair design. The coin was struck from an alloy of 86% gold, 10% copper, and 4% silver. Inscriptions around the outer rim of the coin displays the weight of each respective metal in grams, each character separated by stars: "G 6 S .3 C .7 GRAMS." The precise mintage of the coin is unknown (they were mainly only given to members of Congress), but about 425 of the Flowing Hair Gold Stella coins are believed to be dated 1879, though only about 15 of them were likely struck during that year. (Most were actually minted in 1880.) This is exceptionally low for a U.S. coin of any kind. Only 30 of the Coiled Hair Stellas are known between the two years of issue. One of these ultra-rare gold coins is coming to auction through Bonham's on September 6th (pictured, above). Its surface doesn't really exhibit the proof finish due excessive to wear, which is uncommon for this series, leading experts to believe it was likely incorporated into a piece of jewelry at some point. Despite its compromised condition, this 1789 Flowing Hair example is expected to realize as much as $60,000 next month. By comparison, an 1880 Coiled Hair Stella in mint condition sold for $2.6 million three years ago. 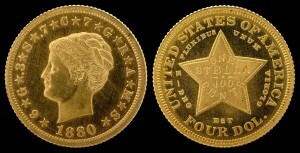 Another 1879 Gold Stella sold for more than $1 million at the same auction.